Is the Russian Blue cat hypoallergenic and does she really hail from Russia? Learn some fun facts and this fascinating and gorgeous breed! If a cat with mystique is what you seek, then you truly can’t look further than the Russian Blue cat. Shrouded in a cloud of mystery, the blue-hued beauty has a history based solely on legend — with no proven facts regarding her origins. 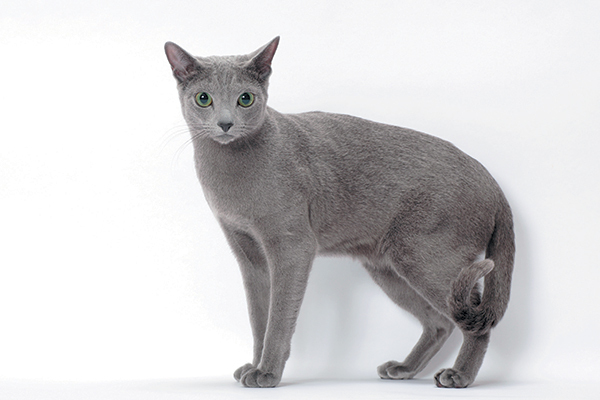 A Russian Blue cat. Photography by Tetsu Yamazaki. In one bit of Russian Blue lore, it’s said that the breed is a descendant of the royal felines kept by the Russian tsars. Contrary to that fun splash of folklore is the rumor that the Russian Blue cat actually originated on Northern Russia’s Archangel Isles (giving the breed the nickname Archangel Cat), where the breed was picked up by sailors in the 1800s and brought to Europe. 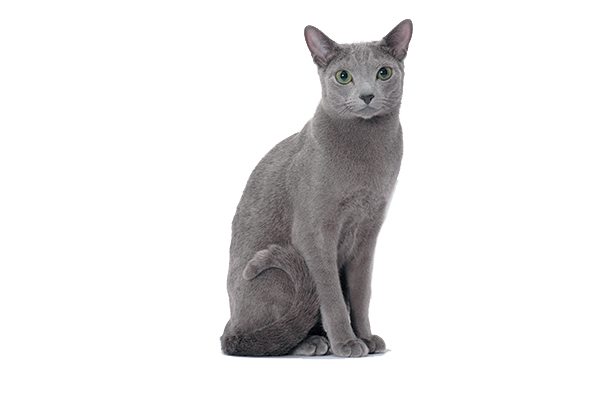 And according to folklore, the Russian Blue is said to bring not just good luck but healing abilities, too! The Russian Blue has a naturally upturned mouth that has garnered her comparisons to Leonardo da Vinci’s Mona Lisa. 3. Are Russian Blue cats truly blue or gray? Oh, she’s blue all right — with a silver cast that electrifies this feline! A diluted version of the gene responsible for black hair is what produces the silvery coat seen on the Russian Blue. But that’s not the only thing that keeps her in a class of her own: Her bright green eyes, silky-to-the-touch double-layered coat and lithe body make her one of a kind. Though not technically a high-maintenance housemate, the Russian Blue is very particular about hygiene in the bathroom, so keep her litter box spotless! A Russian Blue cat is shy and reserved until she thinks you’re worthy of her presence. Though gentle and quiet in nature, the Russian Blue has a soft spot for high places, where she can people watch for hours until she gets a feel for your personality. Guests might be ignored, but family members receive all of the loyalty. And if you’re her No. 1, she’ll shadow you like crazy and even hitch a ride on your shoulder from time to time. Even better? 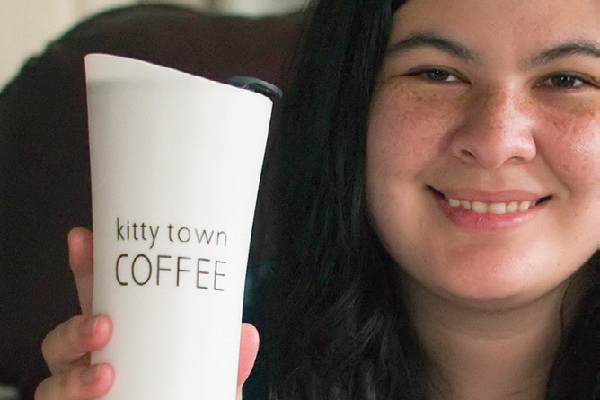 She’s an independent kitty, so she doesn’t mind hanging at home by herself, making her the perfect breed for working singles! If you’re her favorite human, be ready for nonstop love, because she is all about you, you and more you. Feeling out of sorts? She’ll stick by your side, working her healing abilities on you until you’re up and at ’em again! Prepping dinner? She’ll chill by your side, acting as taste tester. Binge-watching a new TV show? 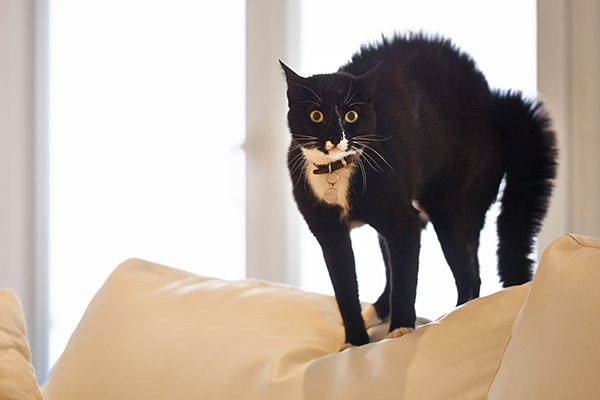 She’ll curl up by your side — just have a comb handy, as she loves being brushed while watching the tube! 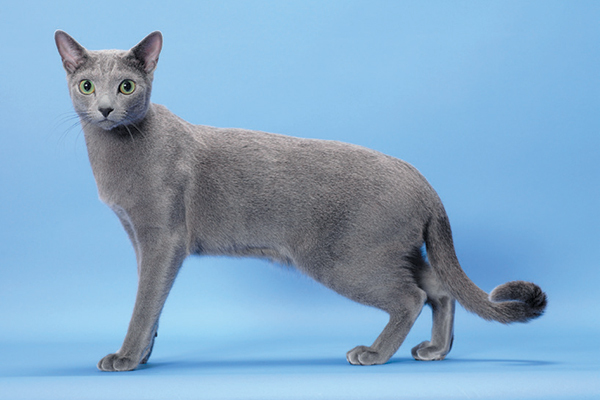 The Russian Blue moves with the same type of lithe grace as a Russian ballerina, so you can expect to see her dancing through the hallways of your humble abode whenever she feels the urge — day or night. She may be flexible when it comes to movement, but the Russian Blue is a creature of habit when we’re talking daily activities. Meals should arrive on time, and her environment should remain both quiet and stable. Think of her as a furry alarm clock. While the Russian Blue sheds less frequently and produces a lower level of the Fel d 1 protein than other breeds, she still produces dander, making her a kitty who won’t solve your allergy issues. The Russian Blue was once nicknamed the “Doberman Pinscher of Cats” by a judge at a cat show due to the breed’s long, muscular body, which manages to be both elegant and athletic. Where is there a reputable breeder for Russian Blue cats. I live in California, but will travel if need to be. My russian blue Lumen is very intelligent. She is trained to sit and eat on command. Athletic, very petite, and kind of a bully to other cats and dogs -deadly to anything smaller! The traits mentioned sound accurate to me. The biggest missing one is all the people who tell you that your cat is pretty. How do Blues get along with house dogs? Russian Blues are very intelligent. My female knows commands and obeys. If I say no she responds with a quiet meow but obeys. My male is the most affectionate cat I have ever had while my female decides when she is to be loved. She sits on my shoulder while I put on makeup and knows how to signal me to bend over so she can jump onto high places like the top of an armoire or top shelf of the closet. 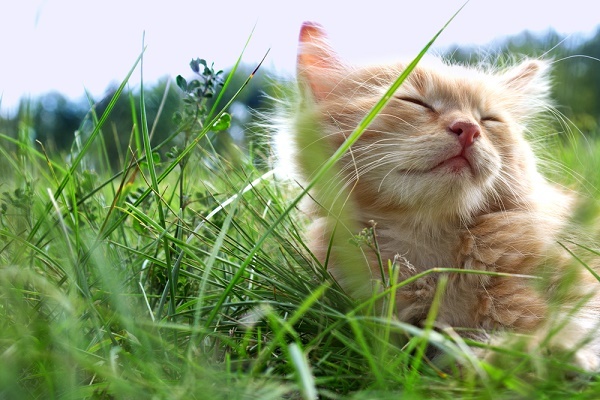 Love this breed and are very loyal and clean cats. Our Russian blue loves to talk and so lovable, sometimes to much but she sure pushes the other cats around even big cats. She can mean or love able. They are exactly like this and they love to play fetch. They never tire of bringing you mice, love affection, and are sensitive. 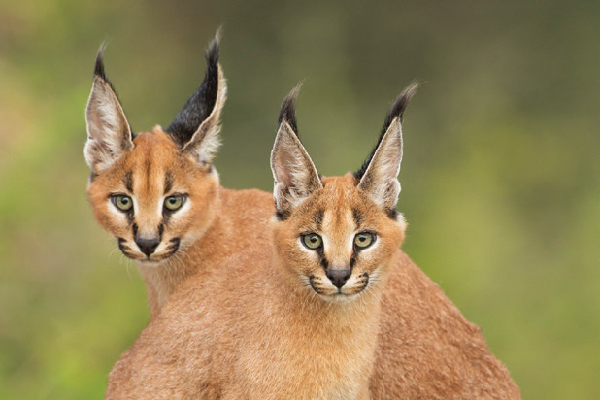 It takes time for them to develop a cattitude, and they’re excellent jumpers. Beautiful cat to watch walk, like a mini panther. You have the excellent jumper correct for sure! Our Luna the Velociraptor lol at just 6 weeks old jumped up onto our washer from the floor! She was born April 8th and we got her May 29th. She is the best cat ever! I have never seen a cat behave so well. Not even adult cats and she is still basically a toddler. I had to go read to my kids about where it said if you are her no. 1 she will hitch a ride on your shoulder. Since we got her that is what she has done to my kids. They are 15 and 12 so it is pretty calm in our house. There is something though that we don’t understand. Every morning she literally flips out. She will run from my Daughter’s room at the end of the hall full speed into the living room then turn around and go back. She will do this for about 10 minutes. Every single morning. She has free reign of the house 24/7 except master bedroom. My Husband has to wake up at 4:30 in the mornings during the week so we shut the door so she doesn’t wake him up. She sleeps half the night in my Daughter’s bed then at some point switches to my Son’s top bunk with him. She has figured out how to climb the rungs of the ladder. All in all she is the best cat and pet we have ever had and we love our furry Velociraptor Luna.